When Gina Oliva first went to school in 1955, she didn’t know that she was “different.” If the kindergarten teacher played a tune on the piano to signal the next exercise, Oliva didn’t react because she couldn’t hear the music. So began her journey as a “solitary,” her term for being the only deaf child in the entire school. Gina felt alone because she couldn’t communicate easily with her classmates, but also because none of them had a hearing loss like hers. It wasn’t until years later at Gallaudet University that she discovered that she wasn’t alone and that her experience was common among mainstreamed deaf students. Alone in the Mainstream recounts Oliva’s story, as well as those of many other solitaries. 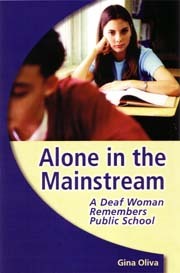 In writing this important book, Oliva combined her personal experiences with responses from the Solitary Mainstream Project, a survey that she conducted of deaf and hard of hearing adults who attended public school. Oliva matched her findings with current research on deaf students in public schools and confirmed that hearing teachers are ill-prepared to teach deaf pupils, they don’t know much about hearing loss, and they frequently underestimate deaf children. The collected memories in Alone in the Mainstream add emotional weight to the conviction that students need to be able to communicate freely, and they also need peers to know they are not alone. Gina A. Oliva is a former professor in the Department of Physical Education and Recreation at Gallaudet University.